China Aviation Oil is the Largest jet fuel supplier in Asia-Pacific CAO is the largest physical jet fuel trader in the Asia-Pacific region and the sole supplier of imported jet fuel to the civil aviation industry of China. In recent report it recorded earnings per share grew to 2.08 US cents from 1.33 US cents in the previous year. CAO has proposed a final dividend of 4.5 Singapore cents per share from 3 Singapore cents in the previous year. CAO is trading on 9.2x our FY17e EPS, at a 32% discount to its closest peer World Fuel Services. Technically it looks good today as it breakout of the sideway consolidation that lasted for 7 month, we have been watching this counter since last year August but it is not moving. Now could be a better time to look at this stock as it cleared the resistance, I am bullish on China Aviation Oil as long as it can stay above $1.58. 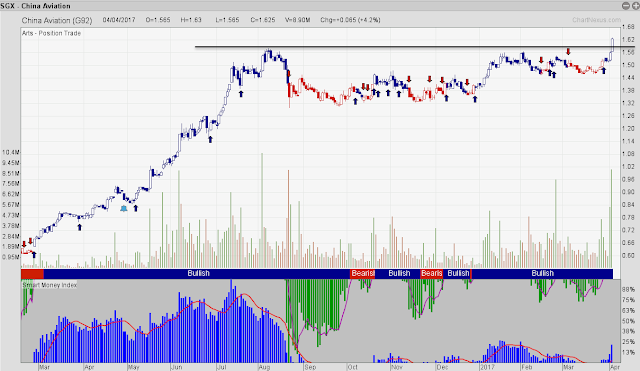 The previous rally, price went from 0.66 to 1.58, if you set a target, you probably get out too early. I will be looking at more than 25% and if the big trend is here, ride it to the end. Upcoming FREE Seminar: Click here/the picture to find out more!